Mystery solved! My family (evan + hera) and I have walked by this site many times and wondered what the story was. A beautiful block of veggies instead of houses in our Bridgeland neighborhood. Well, apparently the city has declared it a municipal historic resource. I went on a very interesting tour of a Hutterite colony this summer. They were a very open and welcoming group. Many a doe-eyed little girl in a head kerchief peeping from behind mother's skirt. It was great to see farming up close, and to expand my experience of farm life beyond the torment I endured as a 'city slicker' on my cousins' farm as a kid. Precious memories include: Sleeping in a room full of mounted animal heads with glow in the dark eyes (always fun when you're seven!) , getting tricked into touching the electric pig fence (shocking! heh), and watching my cousins catch garter snakes by the tail and snapping their heads off. Good times! Anyhoo, where was I. The Hutterites in Alberta are not Luddites by any stretch. In fact another uncle told me about what a powerful influence they have on local economies in certain parts of the province due to thier consumption of fertilizer and other agricultural technology. The colony I visited was a modern large scale farm, with chicken battery cages and warehouses full of thousands of turkeys and sheep that would never see the light of day. Needless to say, being right in the middle of an industrial farming operation pretty much confirmed my bleeding-heart-tree-hugging-rabbit-food-eating views on the subject. All this being said -- I think there's hope out there.. like on Vital Greens Farm! If you'd like to see some video of Albertan organic farmers in action, see below. Just tune out the narrator who has possibly had ten cups of coffee. Q: Is there anything better in the known universe than a toasted tomato sandwich? A: No, no there isn't. Just got wind of a great blog, which I've seen before.. They are participating in Picklefest 2008 -- a giant pickling party. The couple who write this blog, Erik Knutzen and Kelly Coyne, are teaching everyone how to lacto-ferment food, which involves brine instead of a hot water bath (how saurkraut is made). This apeals to me because it would involve a whole lot less energy being spent (my utility bill went up when I did a ton of canning). Can't resist the challenge of making my own kimchi. Bill Anderson grew nearly 11,000 tomatoes last year. He isn't alone in his obsession. Harvest time is approaching. I am trying not to feel too mournful about the coming season. Zen Master Dogen said that every season is perfect in and of itself. Fall is not the beginning of Winter, it is Fall. Spring is not the beginning of Summer, it is Spring. I try to think of this, and of another observation I heard once, that only city people expect warm sunny weather all the time. Anyone who needs to grow food understands that all seasons are important and have their place. So I tried to remember that this afternoon as I blanched and froze this beautiful chard today, and looked forward to eating it in the months ahead. I was listening to Wildrose Country on CBC 1 yesterday afternoon, and heard some good garden tips. The gardening expert said that if you have too many green tomatoes (which everyone in Calgary has this year..) you can ripen them by pulling up the plant and hanging them in the basement, and allowing the tomatoes to ripen on the vine. I'm going to have to give that a try. Our red to green tomato ratio is probably ten to one at the moment. 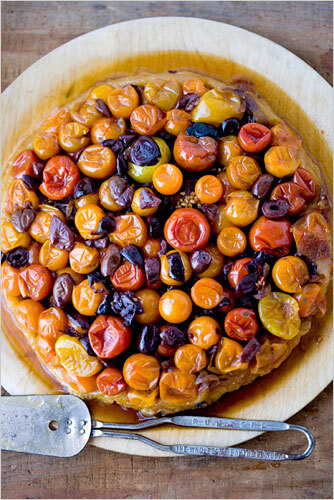 Once I have some ripe ones I think I'm going to try this recipe for Caramelized Tomato Tarte Tatin. I have discovered something new that is rather addictive. It's called Health Nut Choc Ooh Lala. Can't argue with a name like that.. It's organic raw hemp nut spread with cocoa and carob, and it is rather amazing. Tastes a lot like Nutella, but I'm getting my omega fatty acids while noming chocolate. OK OK the cocoa is not local.. but the spread is produced in Kelowna. And it has 1 g of suger per tablespoon. Wikipedia tells me that Nutella has 12 g of sugar per Tbs., which translates into 210 g of sugar in every 371 g jar. Which is INSANE. First frost last night. Sigh! We bundled up the tomato plants in the garden in old blankets my parents donated, which I remember from many a long drive across the Rockies in the family station wagon. Hera our puppy thought the new forms in the garden were intruders, and barked and growled at them like a good guard pup should. Saskatoons take a long time to pick but it's worth it. Combine all ingredients in a heavy saucepan and bring to a gentle boil. Simmer for 20 minutes, stirring frequently. Remove 2 cups of the chutney mixture and puree it in a food processor. Return the puree to the saucepan and continue simmering, stirring frequently until thickened, about another 20 minutes. Pour into hot jars and use water canning method. Makes five 8 oz jars. As it gets colder I've been watching the fruit on the trees in my neighborhood fall and start to rot on people's front lawns. It has crossed my mind to go on a reconnaisance mission in the middle of the night and make some apple butter, but so far I've thought better of it. A group in Toronto has done one better, and has created a service where volunteers harvest fruit for property owners who don't have time to do it themselves. The group gives 1/3 of the harvest to the homeowner, 1/3 to the volunteers, and 1/3 to local food banks.